The Nīlakaṇṭha Dhāraṇī, also known as the Mahākaruṇā(-citta) Dhāraṇī, Mahākaruṇika Dhāraṇī or Great Compassion Dhāraṇī, (or Mantra) (Chinese: 大悲咒 Dàbēi zhòu; Japanese: 大悲心陀羅尼 Daihishin darani or 大悲呪 Daihi shu; Vietnamese: Chú đại bi or Đại bi tâm đà la ni; Korean: 신묘장구대다라니 (Hanja: 神妙章句大陀羅尼) Sinmyo janggu daedarani), is a Mahayana Buddhist dhāraṇī associated with the bodhisattva Avalokiteśvara. The dhāraṇī is thought to have originally been a recitation of names and attributes of Harihara (a composite form of the Hindu gods Vishnu and Shiva; Nīlakaṇṭha 'the blue-necked one' is a title of Shiva) said to have been recited by Avalokiteśvara, who was sometimes portrayed as introducing popular non-Buddhist deities (e.g. Hayagriva, Cundi) into the Buddhist pantheon by reciting their dhāraṇīs. Over time, these deities became considered to be the various forms or incarnations of Avalokiteśvara, who was described in texts such as the Lotus Sutra as manifesting himself in different forms according to the needs of different individuals; the dhāraṇī thus came to be considered as addressed to Avalokiteśvara as Nīlakaṇṭha, now understood to be a manifestation of the bodhisattva. From Nīlakaṇṭha Avalokiteśvara, this particular dhāraṇī eventually became associated with another of Avalokiteśvara's forms, namely the thousand-armed (sahasra-bhuja) one, and became attached to Buddhist texts concerning the thousand-armed Avalokiteśvara. Different versions of this dhāraṇī, of varying length, exist; the shorter version as transliterated into Chinese characters by Indian monk Bhagavaddharma in the 7th century enjoys a high degree of popularity in East Asian Mahayana Buddhism - especially in Chinese Buddhism - comparable to that of the six-syllable mantra Oṃ maṇi padme hūṃ, which is also synonymous with Avalokiteśvara. It is often used for protection or purification. In Korea, copies of the dhāraṇī are hung inside homes to bring auspiciousness. In Japan, it is especially associated with Zen, being revered and recited in Zen schools such as Sōtō or Rinzai. Various different recensions of this dhāraṇī are in existence, which can be classified into two main versions: the shorter text and the longer text. The text currently considered to be the standard in most of East Asia is the shorter version, specifically the one found in the so-called 'Sūtra of the Vast, Perfect, Unimpeded Great-Compassionate Heart of the Thousand-Handed Thousand-Eyed Bodhisattva Avalokitasvara's Dhāraṇī' (Chinese: 千手千眼觀世音菩薩廣大圓滿無礙大悲心陀羅尼經; pinyin: Qiānshǒu qiānyǎn Guānshìyīn púsà guǎngdà yuánmǎn wúài dàbēixīn tuóluóní jīng； T. 1060, K. 0294) translated by a monk from western India named Bhagavaddharma (Chinese: 伽梵達摩; pinyin: Jiāfàndámó, birth and death dates unknown) between 650-660 CE. Twelve scrolls of Nīlakaṇṭha Lokeśvara texts in Chinese were found at Dunhuang along the Silk Road in today's Gansu province of China. One of the texts contains a colophon at the end: "Translated at Khotan by the śramaṇa Bhagavaddharma of Western India" (西天竺伽梵達摩沙門於于闐譯). The milieu of this transliteration is evident from Bhagavaddharma's rendering of the word Nīlakaṇṭha as 'Narakindi' (Chinese: 那囉謹墀; pinyin: Nàluōjǐnchí), a Central Asian form of the Sanskrit word. Two versions by or attributed to esoteric Buddhist teacher Vajrabodhi: (1) 'Copy of the Vast, Perfect, Unimpeded Great-Compassionate Heart of the Thousand-Handed Thousand-Eyed Bodhisattva Avalokitasvara's Dhāraṇī' (Chinese: 千手千眼觀自在菩薩廣大圓滿無礙大悲心陀羅尼咒本; pinyin: Qiānshǒu qiānyǎn Guānzìzài púsà guǎngdà yuánmǎn wúài dàbēixīn tuóluóní zhòu běn; T. 1061) and (2) 'Ritual Recitation Manual on the Vajraśekhara Yoga on the Great Compassionate King Nīlakaṇṭha Avalokiteśvara' (Chinese: 金剛頂瑜伽青頸大悲王觀自在念誦儀軌; pinyin: Jīngāngdǐng yújiā qīngjǐng dàbēiwáng Guānzìzài niànsòng yí guǐ; T. 1112) The former contains a Chinese transliteration of the dhāraṇī and its corresponding Sanskrit version (in Siddhaṃ script), with the latter being an esoteric ritual manual. Three versions of the dhāraṇī proper by or attributed to Vajrabodhi's disciple Amoghavajra: (1) The Thousand-Handed Thousand-Eyed Bodhisattva Avalokitasvara's Great-Compassionate Heart Dhāraṇī (Chinese: 千手千眼觀世音菩薩大悲心陀羅尼; pinyin: Qiānshǒu qiānyǎn Guānshìyīn púsà dàbēixīn tuóluóní; T. 1064) is an extract from Bhagavaddharma's version, with interlinear glosses and an accompanying explanation of the forty hands (forty standing for the full number of one thousand) of the Thousand-armed Avalokiteśvara, each with a mantra of its own; (2) Sutra of the Bodhisattva Nīlakaṇṭha Avalokiteśvara's Heart Dhāraṇī (Chinese: 青頸觀自在菩薩心陀羅尼經; pinyin: Qīngjǐng Guānzìzài púsà xīn tuóluóní jīng; T. 1111) is a new transliteration, followed by a description of the iconography of Nīlakaṇṭha-Avalokiteśvara and his particular mudra; and (3) The Greatly Merciful (and) Greatly Compassionate Bodhisattva Avalokitasvara-lokeśvararāja's Vast, Perfect, Unimpeded Great-Compassionate Heart of Nīlakaṇṭheśvara Dharani (Chinese: 大慈大悲救苦觀世音自在王菩薩廣大圓滿無礙自在青頸大悲心陀羅尼; pinyin: Dàcí dàbēi jiùkǔ Guānshìyīn zìzàiwáng púsà guǎngdà yuánmǎn wúài zìzài qīngjǐng dàbēixīn tuóluóní; T. 1113b) is a Sanskrit (Siddhaṃ)-Chinese interlinear version with glosses. A version of the dhāraṇī proper by 14th century by Dhyānabhadra (Chinese: 指空; pinyin: Zhǐkōng, died 1363) with the title Dhāraṇī of the Vast, Perfect, Unimpeded Great-Compassionate Heart of the Bodhisattva Avalokiteśvara (Chinese: 觀自在菩薩廣大圓滿無礙大悲心陀羅尼; pinyin: Guānzìzài púsà guǎngdà yuánmǎn wúài dàbēixīn tuóluóní; T. 1113a) Unlike the aforementioned versions, Dhyānabhadra's text is based on the longer form of the dhāraṇī. In addition, there are texts bearing the "Thousand-armed Avalokiteśvara" title, but which feature a completely different dhāraṇī within the text. Two translations by a monk named Zhitōng (智通) made between 627-649, both entitled Sūtra of the Thousand-Eyed Thousand-Armed Bodhisattva Avalokitasvara's Mystic Dhāraṇī (Chinese: 千眼千臂觀世音菩薩陀羅尼神咒經; pinyin: Qiānyǎn qiānbì Guānshìyīn púsà tuóluóní shénzhòu jīng; T. 1057a and 1057b, Nj. 318) This is the earliest of the Chinese "Thousand-armed Avalokiteśvara" sutras. Despite the title, the sutra's dhāraṇī is completely different from the Nīlakaṇṭha dhāraṇī found in other versions. A translation made by north Indian monk Bodhiruci in 709 entitled Sūtra of the Thousand-Handed Thousand-Eyed Bodhisattva-mother Avalokitasvara's Dhāraṇī-body (Chinese: 千手千眼觀世音菩薩姥陀羅尼身經; pinyin: Qiānshǒu qiānyǎn Guānshìyīn púsàmǔ tuóluóní shēn jīng; T. 1058, Nj. 319) Bodhiruci's version contains the same dhāraṇī as Zhitōng's. At least three versions of the longer form of the dhāraṇī exist in Tibetan. One was made in the middle of the 9th century by a translator named Chödrup (Wylie: Chos grub; Chinese: 法成 Fǎchéng) supposedly from Chinese, but which does not correspond exactly to any Chinese version, being more akin to that of Vajrabodhi. Among the various versions of the dhāraṇī, it is the longest and fullest. Preceding Chödrup is an anonymous translation of the same text. A third version was made by Changkya Rölpé Dorjé (Wylie: Lcang skya Rol pa'i Rdo rje) in the 18th century. While claimed to be a reconstruction of Zhitōng's text using a Tibetan version as a base, Changkya Rölpé Dorjé's text actually completely follows the Tibetan readings, with significant differences from Chödrup's version in a number of places, rather than Zhitōng's. 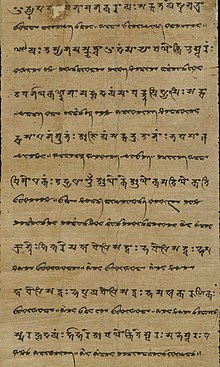 A manuscript fragment (currently in the British Library) dating from around the 8th century containing the longer version of the dhāraṇī (Or.8212/175) in both late Brahmi and Sogdian scripts was discovered by Sir Aurel Stein in the Mogao Caves at Dunhuang and published by Robert Gauthiot and Louis de La Vallée-Poussin in 1912. The dhāraṇī's title is given in this manuscript as 1 LPw δsty ʾʾryʾβṛʾwkδʾyšβr nyṛknt nʾm tʾrny "the dhāraṇī of the names of Āryāvalokiteśvara-Nīlakaṇṭha with a thousand hands." The text shows a very close affinity to that found in Vajrabodhi's T. 1061 text. The dhāraṇī is followed by a short, unidentified mantra named wyspw ʾʾγδʾk δβrʾynʾk δrzyʾwr ptsrwm "hṛdaya mantra fulfilling all the wishes." According to author Lokesh Chandra (1988), the dhāraṇī in its original form was a recitation of the names of the deity (lokeśvara) Nīlakaṇṭha recited by the bodhisattva Avalokiteśvara: "Avalokiteśvara was responsible for introducing popular (loka) deities (iśvara) into the Buddhist pantheon by pronouncing their dhāraṇīs which averted evils to the person who obtained his wishes as soon as he recited it (paṭhita-siddhaḥ, Dutt: text 44)." In Vajrabodhi's longer version (T. 1061), the dhāraṇī is explicitly referred to as Āryāvalokiteśvara-bhāṣitaṃ "uttered (bhāṣita) by noble (ārya) Avalokiteśvara;" at this stage, Avalokiteśvara is portrayed as pronouncing the dhāraṇī, but is not (yet) identified with Nīlakaṇṭha. It is reported by Kwan Tseu Tsai Bodhisattva, prompted by her great compassionate heart has engaged herself by a great oath to enter into every one of the innumerable worlds, and bring deliverance to all creatures who inhabit them. For this purpose she has enunciated the Divine sentences which follow, if properly recited, will render all creatures exempt from the causes of sorrow, and by removing them, render them capable of attaining Supreme Reason. During the process of transmission, however, Nīlakaṇṭha became increasingly identified with Avalokiteśvara, so that the dhāraṇī eventually became understood as being addressed to Avalokiteśvara as Nīlakaṇṭha, now considered to be one of Avalokiteśvara's various forms or manifestations - most of whom were themselves originally folk deities who were assimilated into Avalokiteśvara upon being integrated into Buddhist belief and practice (e.g. Hayagriva, Cundi, Tara or Mazu; cf. also Shinbutsu-shūgō). A depiction of Vishnu (Vaikuntha Chaturmurti) showing three faces: lion, human, and boar. The dhāraṇī proper contains a number of titles associated with the Hindu gods Vishnu (e.g. Hare, Narasiṃha-mukha , gadā- / cakra- / padma-hastā 'the wielder of the mace / discus / lotus') and Shiva (e.g. Nīlakaṇṭha 'the blue-necked one', Śaṅkara, kṛṣṇa-sarpopavita 'the one who has a black serpent as a sacred thread'), suggesting that Nīlakaṇṭha was in origin Harihara - a fusion of Vishnu (Hari) and Shiva (Hara) - assimilated into Buddhism. This is more explicit in the longer version of the dhāraṇī, where Nīlakaṇṭha is invoked with more names and epithets associated with the two gods such as Tripūra-dahaneśvara 'the Lord (Īśvara) who destroyed / burnt down Tripūra' (Shiva) or Padmanābha 'lotus-naveled' (Vishnu), as well as a short description of the iconography of Nīlakaṇṭha Avalokiteśvara in Amoghavajra's version (T. 1111), which combines elements from depictions of Shiva and Vishnu. 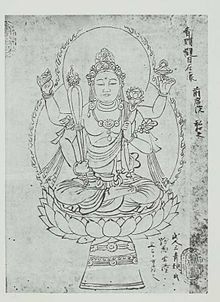 Nīlakaṇṭha-Avalokiteśvara (青頸觀自在), from the Besson-zakki, a Japanese (Heian period) compendium of Buddhist iconography. Note the differences between this particular depiction and the description from Amoghavajra: while the four attributes - conch, mace/rod, discus/wheel and lotus - are depicted, the boar and lion faces, the garments of animal skins, and the serpent upavita are omitted. "Next, I shall explain here the manner of depicting the bodhisattva Nīlakaṇṭha-Avalokiteśvara. "His figure is three-faced: in the center is fashioned a compassionate, serene face, on the right a lion's face, (and) on the left a boar's face. On his head is a crown, (and) within the crown is an emanation (i.e. an image) of the buddha Amitāyus. "In addition, he has four arms: the first right arm holds a rod, the second (right) arm grasps a lotus; the first left (arm) holds a wheel, (and) the second left (arm) holds a conch. "(Wearing) a tiger skin as his lower garment, a black antelope skin is draped diagonally from his left shoulder, and a black serpent is his sacred thread. Standing on an eight-petaled lotus, the effulgence of necklaces, armlets and ornaments adorn his body; his sacred thread hangs diagonally from the left shoulder downward." The status of Shiva and Vishnu in the dhāraṇī follows a similar pattern to the one identified in the Kāraṇḍavyūha Sūtra (4th-5th century CE): the two gods are repeatedly invoked one after the other, indicating that they stand in a "complementary" relationship to each other. At the same time, however, Shiva is portrayed as the dominant of the two. The first of many images of the thousand-armed (sahasra-bhuja) Avalokiteśvara - a form of the bodhisattva that would subsequently become popular in East Asia - to appear in China was presented to the Tang Emperor by a monk from central India named Guptadeva(?) (瞿多提婆, pinyin: Qúduōtípó) somewhere between 618 and 626 CE. While as of yet, no trace of this iconographic depiction has been found within India itself, the depiction must have had an Indian origin: an image of this type was brought to China by an Indian monk, and all the Chinese texts on the thousand-handed Avalokiteśvara are translations from Sanskrit or Pali and contain Sanskrit hymns in transliteration. One possibility is that this form of Avalokiteśvara had its origins in Kashmir, whence the Kāraṇḍavyūha Sūtra may also have originated. 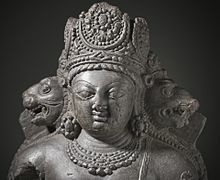 From Kashmir, the "thousandfold" Avalokiteśvara might have spread northward, but not southward into the Indian mainland, which could explain the dearth of Indian artifacts connected to this depiction. A 10th-11th century statue of Avalokiteśvara from the western Himayalan region, with the skin of a black antelope (kṛṣṇājina) - originally an attribute of Shiva - slung over his left shoulder. "Āditya and Candra came from his eyes, Maheśvara came from his forehead, Brahmā came from his shoulders, Nārāyaṇa came from his heart, Devi Sarasvatī came from his canines, Vāyu came from his mouth, Dharaṇī came from his feet, and Varuṇa came from his stomach." The epithets sahasra-bāhu ('thousand-armed') or sahasra-bhuja ('thousand-handed') commonly appear in Indian literature from the Ṛgveda onwards applied to various personages (e.g. Kartavirya Arjuna), including the gods Shiva and Vishnu. 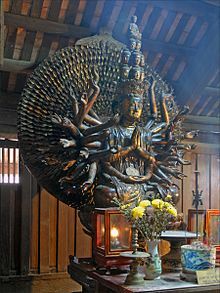 It has been suggested that the thousand arms of Avalokiteśvara is another example of an attribute of Shiva being assimilated into the bodhisattva, with the thousand arms being a symbol of the victory of Avalokiteśvara (and Buddhism) over Shiva, whose name 'Īśvara' he appropriates, and his cult. (Cf. Trailokyavijaya, one of the five Wisdom Kings, depicted as trampling on Maheśvara - the Buddhist version of Shiva - and his consort.) The thousand-armed Avalokiteśvara's eleven heads, meanwhile, are thought to be derived from the eleven Rudras, forms and companions of Shiva (Rudra). Originally portrayed as a servant or acolyte of the buddha Amitābha in some of the texts which mention him, Avalokiteśvara - originally 'Avalokita(svara)' - also later came to be depicted as one who brought popular deities into Buddhism by pronouncing their hymns, thereby according them a place in Buddhist scriptures and ritual. Eventually, however, these deities came to be identified as different forms or manifestations of the bodhisattva himself. Thus Avalokiteśvara gradually took on forms, attributes and titles originally ascribed to Shiva and/or to Vishnu such as sahasra-bhuja, sahasra-netra ('thousand-eyed'), Īśvara, Maheśvara, Hari, or Nīlakaṇṭha. The emergence of Avalokiteśvara's thousand-armed form is linked with the interiorisation of Shiva into the bodhisattva as Viśvarūpa. The dhāraṇī of 'Nīlakaṇṭha' (i.e. Harihara - Vishnu and Shiva - later conflated with Avalokiteśvara) became attached to the sahasra-bhuja Avalokiteśvara (of which Harihara was the prototype), so that the thousand-armed form became seen as a bestower of royal authority, a trait carried over from Nīlakaṇṭha/Harihara. Indeed, in Sri Lanka, Tibet and Southeast Asia, Avalokiteśvara became associated with the state and with royalty. Classic Mahayana teaching holds that Avalokiteśvara is able to manifest in different forms according to the needs of different individuals. In the Lotus Sūtra, it is stated that Avalokiteśvara can appear in different guises - which includes that of 'Īśvara' and 'Maheśvara' - to teach the Dharma to various classes of beings. 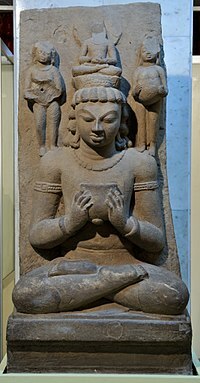 A sandstone sculpture of Nīlakaṇṭha Avalokiteśvara from Sarnath circa 6th century CE. This particular depiction is based on the Hindu god Shiva about to swallow the halāhala poison. The Buddha said to Bodhisattva Akṣayamati: "O son of a virtuous family! If there is any land where sentient beings are to be saved by the form of a buddha, Bodhisattva Avalokiteśvara teaches the Dharma by changing himself into the form of a buddha. ... To those who are to be saved by the form of Brahma, he teaches the Dharma by changing himself into the form of Brahma. To those who are to be saved by the form of Śakra, he teaches the Dharma by changing himself into the form of Śakra. To those who are to be saved by the form of Īśvara, he teaches the Dharma by changing himself into the form of Īśvara. To those who are to be saved in the form of Maheśvara, he teaches the Dharma by changing himself into the form of Maheśvara. ... To those who are to be saved by the form of a human or of a nonhuman such as a deva, nāga, yakṣa, gandharva, asura, garuḍa, kiṃnara, or mahoraga, he teaches the Dharma by changing himself into any of these forms." Despite being a latecomer among the esoteric forms of Avalokiteśvara introduced into China, because of the promotion of his cult by the three esoteric masters (Śubhakarasiṃha, Vajrabodhi and Amoghavajra have all made translations of thousand-armed Avalokitesvara texts) and patronage by the imperial court, the sahasra-bhuja Avalokitesvara overtook and absorbed the fame of other tantric forms of the bodhisattva. Out of the various transliterations of the dhāraṇī in Chinese, that of Bhagavaddharma (T. 1060) has risen to become the standard in East Asia. Bhagavaddharma was a monk who came to China from western India around the mid-7th century, about whom nothing else is known; the Taishō Tripitaka has only two works in Chinese by him, both on the thousand-armed Avalokiteśvara (T. 1059, 1060). The latter of these two works, the 'Sūtra of the Vast, Perfect, Unimpeded Great-Compassionate Heart of the Thousand-Handed Thousand-Eyed Bodhisattva Avalokitasvara's Dhāraṇī', made at Khotan around 650-661 CE, has made him immortal. The popularity of his version is attested by surviving Dunhuang manuscripts dated to the 8th century, some of which are excerpts of the ten great vows contained in the sūtra. In China itself, various anecdotes about miracles effected by the recitation of the dhāraṇī appear from the Tang dynasty onwards. As the dhāraṇī's efficacy became widely known, dhāraṇī pillars on which the dhāraṇī's text was inscribed began to be erected, the earliest of these dating from 871 CE. By the end of the period, both the sūtra text and the dhāraṇī circulated among the monks and the laity, with copies being made either as pious offerings or commissioned by the faithful to obtain religious merit. An abbreviated version of the sūtra, consisting of only the ten great vows recited by Avalokiteśvara within the text (see 'Summary' below) and the dhāraṇī itself, was also in circulation. Known as the 'Invocation of the Great Compassionate One' (大悲啟請 Dàbēi qǐqǐng), this text was probably used in a liturgical setting. The reason behind the subsequent popularity of Bhagavaddharma's sūtra is thought to be due to its relative simplicity compared to other versions: while other sūtras on the thousand-armed Avalokiteśvara contained detailed rules on how to visualize and depict this form of the bodhisattva, the very lack of such instructions in Bhagavaddharma's text might have contributed to its democratic appeal for ordinary people. In addition, Bhagavaddharma's version is the only one that contained the sections on the ten great vows and the blessing of the fifteen kinds of good deaths as well as protection from fifteen kinds of bad deaths. The dhāraṇī's concrete power over death and the comprehensiveness of Avalokiteśvara's vows might have been another factor that appealed to the masses. Because of the great popularity enjoyed by this sūtra, the epithet 'Great Compassionate One' (大悲 Dàbēi) became identified specifically with the sahasra-bhuja Avalokiteśvara from the Tang period on, though previously it was used in other sūtras to describe Avalokiteśvara in general. Bhagavaddharma's text begins with Śākyamuni Buddha in Avalokiteśvara's palace on the island Potalaka about to preach to a congregation of bodhisattvas, arhats, devas and other beings. Suddenly there is a great illumination and the three thousand realms become golden in color, shaking all over while the sun and moon become dull by comparison. One of the bodhisattvas present, Dhāraṇī King (總持王菩薩), asks the Buddha why this is happening; the Buddha reveals that Avalokiteśvara secretly emitted this light "in order to comfort and please all living-beings." Avalokiteśvara then begins to speak, revealing that innumerable kalpas ago, the Thousand-light King Tathāgata of Tranquil Abode (千光王靜住如來) entrusted to him the 'Dhāraṇī of the Great Compassionate Heart' (大悲心陀羅尼呪). As soon as he heard the dhāraṇī, Avalokiteśvara - who had then been a bodhisattva of the first stage - quickly advanced to the eighth stage, and after reciting a vow, became endowed with a thousand hands and eyes: "So from that epoch long ago, I have kept the dhāraṇī. As a result, I have always been born where there is a buddha. Moreover, I have never undergone birth from a womb, but am always transformed from a lotus." 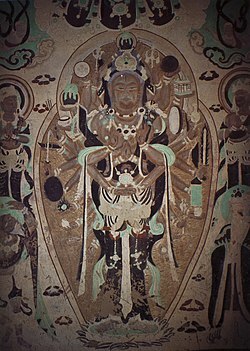 A Tang period depiction of the thousand-armed Avalokiteśvara from the Yulin Caves, Gansu Province, China. After giving this explanation, he then calls upon anyone who wants to keep this dhāraṇī to give rise to the thought of compassion for all sentient beings by making the following ten vows after him. Namaḥ Avalokiteśvara of Great Compassion, may I quickly learn all Dharma. Namaḥ Avalokiteśvara of Great Compassion, may I speedily obtain the eye of wisdom. Namaḥ Avalokiteśvara of Great Compassion, may I quickly save all sentient beings. Namaḥ Avalokiteśvara of Great Compassion, may I speedily obtain skillful means. Namaḥ Avalokiteśvara of Great Compassion, may I quickly sail on the prajñā boat. Namaḥ Avalokiteśvara of Great Compassion, may I speedily cross over the ocean of suffering. Namaḥ Avalokiteśvara of Great Compassion, may I quickly obtain the way of discipline and meditation. Namaḥ Avalokiteśvara of Great Compassion, may I speedily ascend the nirvāṇa mountain. Namaḥ Avalokiteśvara of Great Compassion, may I quickly enter the house of non-action. Namaḥ Avalokiteśvara of Great Compassion, may I speedily achieve the Dharma-Body. If I face a mountain of knives, may it naturally crumble, if I face a roaring fire, may it naturally burn out, if I face hell, may it naturally disappear, if I face a hungry ghost, may it naturally be satiated, if I face an Asura, may its evil heart gradually become tame and, if I face an animal, may it naturally obtain great wisdom. After making such vows, one should then sincerely call the name of Avalokiteśvara as well as the name of Amitābha Buddha, Avalokiteśvara's original teacher. Avalokiteśvara stresses the dhāraṇī's efficacy by vowing that should anyone who recites it fall into an evil realm of rebirth, or not be born into one of the buddha lands, or not attain unlimited samādhi and eloquence, or not get whatever he desires in his present life, or, in the case of a woman, if she detests the female body and wants to become a man, he (Avalokiteśvara) will not achieve complete, perfect enlightenment, unless those who recited it were insincere, in which case they will not reap its benefits. Aside from such spiritual and mundane benefits as removing grave sins caused by heinous acts such as the five crimes or the ten evil acts[a] or curing 84,000 kinds of illnesses, the sincere keeping of the dhāraṇī is said to also result in fifteen kinds of good rebirth (e.g. being ruled by a virtuous king wherever one is born, fully endowed with money and food, can see the Buddha and listen to the Dharma in the place of birth) and the avoidance of fifteen kinds of evil deaths (e.g. suicide, death on the battlefield, death by starvation). Avalokiteśvara then recites the dhāraṇī; the earth shakes in six ways, while precious flowers rain down from the sky. As all the buddhas of the ten directions are delighted and practitioners of heterodox ways become frightened, all the assembled reach different levels of realization. Upon being asked by Mahābrahmā (大梵天王), Avalokiteśvara goes on to further explain the dhāraṇī's benefits, both spiritual and temporal, and recites a gāthā commanding various benevolent devas, nāgas and yakṣas to guard the keepers of the dhāraṇī. Like all esoteric sūtras, this sūtra shows interest in ritual matters. As part of the sādhanā or ritual requirement, detailed instructions on constructing a sacred space or boundary are provided: the dhāraṇī is to be recited twenty-one times over a particular item such as a knife, pure water, white mustard seed, clean ashes, or five colored twine, which would then be used to demarcate the boundary. The sūtra also offers many recipes employing the dhāraṇī to deal with various mundane problems (e.g. to ease a difficult childbirth or to cure scotophobia or snakebite) or to attain specific goals (e.g. commanding a ghost or the four guardian gods, repelling foreign invasions or natural disasters away from one's own country). The sūtra then ends by identifying the names of the forty mudrās of the thousand-armed Avalokiteśvara - forty standing for the full number of a thousand - and the respective benefits they bestow on the worshipper. These mudrās are only described verbally on Bhagavaddharma's version; illustrated depictions are found in the version by Amoghavajra (T. 1064). The Guishan Guanyin of the Thousand Hands and Eyes in Changsha, Hunan Province, China. The Nīlakaṇṭha dhāraṇī, now firmly associated with the sahasra-bhuja form of Avalokiteśvara, enjoys a huge popularity in East Asian Mahayana Buddhism. 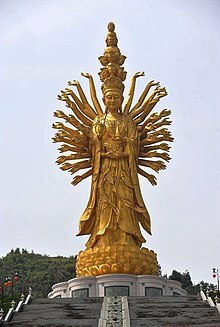 The dhāraṇī is especially revered in China, where the thousand-armed Avalokiteśvara (or Guanyin) is the most popular among the bodhisattva's forms. It is most often called the 'Great Compassion Mantra' (大悲咒 Dàbēi zhòu) in popular parlance, an epithet also (mistakenly) applied to a different, much shorter dhāraṇī, that of the Eleven-headed (Ekadasa-mukha) Avalokiteśvara. Musical renditions of this latter dhāraṇī (such as those made by Imee Ooi or Ani Choying Dolma) are often labelled the Tibetan Great Compassion Mantra (traditional: 藏傳大悲咒, simplified: 藏传大悲咒 Zàngchuán Dàbēi zhòu) or The Great Compassion Mantra in Sanskrit (梵音大悲咒 Fànyīn Dàbēi zhòu) in recordings, adding to the confusion. In Korea, the dhāraṇī - usually referred to as Sinmyo janggu daedalani (신묘장구대다라니; Hanja: 神妙章句大陀羅尼 "The Great Dhāraṇī of Wondrous Verses") or as Cheon-su gyeong (천수경; Hanja: 千手經 "Thousand Hands Sutra") - is also a regular fixture of Buddhist ritual. Copies of the dhāraṇī (written in Hangul and the Korean variant of Siddhaṃ script) are hung inside homes to bring auspiciousness. In Japan, the dhāraṇī is most often associated with the Zen schools of Buddhism such as Sōtō (where it is called 大悲心陀羅尼 Daihishin darani "Dhāraṇī of the Great Compassionate Heart") or Rinzai (which dubs the dhāraṇī 大悲円満無礙神呪 Daihi Enman Muge (or Enmon Bukai) Jinshu "Divine Mantra of the Vast, Perfect Great Compassion" or 大悲呪 Daihi shu - the Japanese reading of Dàbēi zhòu), where it is extensively used: as in many other parts of East Asia, it is chanted daily by Zen monks, and used in funerals as well as in hungry ghost feeding ceremonies (segaki). A version of the dhāraṇī is also found within the esoteric Shingon school: in the early 20th century it was apparently counted as one of three dhāraṇīs (三陀羅尼 san darani) especially revered within the school, the other two being the Buddhoṣṇīṣa Vijaya Dhāraṇī (仏頂尊勝陀羅尼 Bucchō-sonshō darani) and the Guhyadhātu Karaṇḍa-mudrā Dhāraṇī (宝篋印陀羅尼 Hōkyō-in darani). Since then, however, the Root Dhāraṇī of Amitābha (阿弥陀如来根本陀羅尼 Amida nyorai konpon darani) - once counted as an alternative candidate to the Nīlakaṇṭha dhāraṇī - seems to have overtaken its place. Besides some differences in dividing the text and a few (very minor) variances in wording, the Chinese, Vietnamese and Japanese versions of the dhāraṇī are substantially the same, being based either on the short version by Bhagavaddharma (T. 1060) and/or a similar rendition by Amoghavajra (T. 1113b). The following is a version of the dhāraṇī attributed to Amoghavajra (T. 1113b) which is mostly similar to that of Bhagavaddharma, albeit with a different way of dividing the text and an accompanying Sanskrit version written in Siddhaṃ script (Romanized; Sanskrit transliterated as written in the original). A manuscript from Dunhuang (Pelliot chinois 2778) containing the opening portion of the dhāraṇī written in Siddhaṃ script, with a transliteration into Chinese (text given below). While the most commonly used version in East Asia, the shorter version of the dhāraṇī as transcribed by Bhagavaddharma has been criticized as an imperfect rendering based on a defective recitation or manuscript copy. Amoghavajra's Siddhaṃ text in T. 1113b is also badly corrupted. In addition to the use of the Central Asian form 'Narakindi'/'Nilakandi'/'Narakidhi' (那囉謹墀) for Sanskrit Nīlakaṇṭha and other grammatical quirks which betray a Central Asian milieu, certain other portions of the standard text are corrupt beyond recognition. For instance, the passage 室那室那 阿囉嘇佛囉舍利 (Siddhaṃ text of T. 1113b: cinda 2 arṣam pracali), is thought to be a corruption of kṛṣṇa-sarpopavīta "thou with the black serpent as the sacred thread" (attested in other versions and hinted in Amoghavajra's commentary in T. 1111), with the word for 'serpent' (सर्प sarpa) as written in Siddhaṃ script being misread as 2 arsa. Meanwhile, 薩婆菩哆那摩縛伽摩罰特豆 (T. 1113b: sarva-bhutanama vagama vadudu) is a misrendering of sarva-bhūtānām bhava-mārga visodhakam ("(it) cleanses the path of existence of all beings"), with dudu (特豆) being a filler word to cover a portion of the text that was not perceived clearly. The following is a reconstruction of the original Sanskrit text of Bhagavaddharma's version by Chandra (1988) based on a comparison with other versions; his own translation of this text is given below. The form of the dhāraṇī as commonly written and recited in Chinese Buddhism is as follows. nā mo hē là dá nà duō là yè yé. nā mo a lī yé. wó lú jié dì. shuò bō là yé. pú tí sà duǒ wó yé. mó hā sà duǒ wó yé. mó hā jiā lú ní jiā yé. ăn. sà bó là fá yì. shù da nă dá xiĕ. nā mo xī jí lí duǒ. yī mēng. a lī yé wó lú jié dì shì fó là. léng tuó wó. nā mo nă là jĭn chí. xī lī mó hā bó duō shā miē. sà wó a tā dòu. shū péng. a shì yùn. sà wó sà duō nă mó wó sà duō nă mó wó jiā. mó fá tè dòu. dá zhí tā. ăn a wó lú xī. lú jiā dì. jiā luó dì. yí xī lī. mó hā pú tí sà duǒ. sà wó sà wó. mó là mó là. mó xī mó xī lī tuó yùn. jù lú jù lú jié méng. dù lú dù lú fá shé yé dì. mó hā fá shé yé dì. tuó là tuó là. dì lī ní. shì fó là yē. zhē là zhē là. mó mó fá mó là. mù dì lì. yī xī yī xī. shì nă shì nă. a là shēn fó là shě lì. fá shā fá shēn. fó là shě yé. hū lú hū lú mó là. hū lú hū lú xī lī. suō là suō là. xī lī xī lī. sū lú sū lú. pú tí yè pú tí yè. pú tuó yè pú tuó yè. mí dì lī yè. nă là jĭn chí. dì lī sè ní nà. bō yè mó nà. suō wó hā. xī tuó yè. suō wó hā. mó hā xī tuó yè. suō wó hā. xī tuó yù yi. shì bó là yè. suō wó hā. nă là jĭn chí. suō wó hā. mó là nă là. suō wó hā. xī là sēng a mù qū yé. suō wó hā. suō wó mó hā a xī tuó yé suō wó hā. zhě jí là a xī tuó yè. suō wó hā. bō tuó mó jié xī tuó yè. suō wó hā. nă là jĭn chí bó qié là yé. suō wó hā. mó wó lì shèng jié là yè. suō wó hā. nā mo hē là dá nà duō là yè yé. nā mo a lī yé. wó lú jí dì. shuō bó là yè. suō wó hā. ăn xī diàn dū màn duō là bá tuó yé suō wó hā. Nam mô hắc ra đát na đa ra dạ da. Nam mô a rị da, bà lô yết đế, thước bác ra da, bồ đề tát đỏa bà da, ma ha tát đỏa bà da, ma ha ca lô ni ca da. Án tát bàn ra phạt duệ, số đát na đá tỏa. Nam mô tất kiết lật đỏa, y mông a rị da bà lô kiết đế, thất phật ra lăng đà bà. Nam mô na ra cẩn trì hế rị, ma ha bàn đá sa mế, tát bà a tha đậu du bằng a thể dựng, tát bà tát đa, na ma bà gìa ma phạt đạt đậu, đát thiệt tha. Án, a bà lô hê, lô ca đế, ca ra đế, di hê rị, ma ha bồ đề tát đỏa, tát bà tát bà, ma ra ma ra, ma hê ma hê, rị đàn dựng cu lô cu lô kiết mông độ lô độ lô, phạt xà da đế, ma ha phạt xà da đế, đà ra đà ra, địa rị ni, thất Phật ra da, dá ra dá ra. Mạ mạ phạt ma ra, mục đế lệ, y hê y hê, thất na thất na, a ra sâm Phật ra xá lợi, phạt sa phạt sâm, Phật ra xá da, hô lô hô lô ma ra, hô lô hô lô hê rị, ta ra ta ra, tất rị tất rị, tô rô tô rô bồ đề dạ, bồ đề dạ, bồ đà dạ, bồ đà dạ, di đế rị dạ, na ra cẩn trì địa rị sắc ni na, ba dạ ma na ta bà ha. Tất đà dạ ta bà ha. Ma ha tất đà dạ ta bà ha. Tất đà du nghệ thất bàn ra dạ ta bà ha. Na ra cẩn trì. Ta bà ha. Ma ra na ra. Ta bà ha. Tất ra tăng a mục khê da, ta bà ha. Ta bà ma ha a tất đà dạ ta bà ha. Gỉa kiết ra a tất đà dạ ta bà ha. Ba đà ma yết tất đà dạ, ta bà ha. Na ra cẩn trì bàn dà ra dạ ta bà ha. Ma bà lị thắng yết ra dạ ta bà ha. Nam mô hắc ra đát na đá ra mạ da, Nam mô a rị da bà lô yết đế, thước bàn ra dạ, ta bà ha. Án tất điện đô, mạn đa ra, bạt đà dạ, ta bà ha. 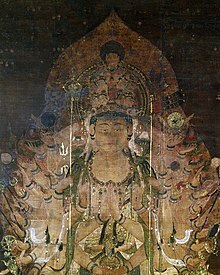 Detail of a 12th-century depiction of the thousand-armed Avalokiteśvara (Senju Kannon) located at the Tokyo National Museum. The following is the dhāraṇī as written and recited within the Sōtō school of Japanese Zen Buddhism. Namu karatannō. Torayāyā. Namu oriyā. Boryokīchī. Shifurāyā. Fujisatobōyā. Mokosatobōyā. Mōkō kyārunikyāyā. En. Sāharahāē shūtannō tonshā. Namu shikirī toimō. Oriyā. Boryokīchī shifurā. Rintōbō. Namu nōrā. Kinjī kīrī. Mōkō hōdō. Shāmī sābō. Ōtō jōshūben. Ōshūin. Sābō sātō. Nōmō bōgyā. Mōhā tēchō. Tōjītō. En. Ōboryōkī. Rūgyāchī. Kyārāchī. Īkiri mōkō. Fujisātō. Sābō sābō. Mōrā mōrā. Mōkī mōkī. Rītōin kūryō kūryō. Kēmō tōryō tōryō. Hōjāyāchī. Mōkōhōjāyāchī. Tōrā tōrā. Chirinī shifurāyā. Shārō shārō. Mōmōhāmōrā. Hōchīrī. Īkī Īkī. Shīnō shīnō. Orasan furashārī. Hāzā hāzān. Furashāyā. Kūryō kūryō. Mōrā kūryō kūryō. Kīrī shārō shārō. Shīrī shīrī. Sūryō sūryō. Fujiyā fujiyā. Fudoyā fudoyā. Mīchiriyā. Norakinjī. Chiri shuninō. Hoyamono. Somokō. Shidoyā. Somokō. Mokoshidoyā. Somokō. Shidoyūkī. Shifurāyā. Somokō. Norakinjī. Somokō. Mōrānōrā somokō. Shirasū omogyāyā. Somokō. Sobomoko shidoyā. Somokō. Shakirā oshidōyā. Somokō. Hodomo gyashidoyā. Somokō. Norakinjī hāgyarayā. Somokō. Mōhori shingyarayā somokō. Namu karatannō torayāyā. Namu oriyā boryokīchī shifurāyā. Somokō. Shitedō modorā. Hodoyā. Sōmōkō. A form of the dhāraṇī which uses a pronunciation scheme different from that used by the Zen schools is attested within Shingon Buddhism. Nōbō. Aratannō tarayāya. Nōbo ariya. Barokitei. Jinbaraya. Bōjisatobaya. Makasatobaya. Makakyaronikyaya. On sarabarabaeishu. Tannō dashiya. Nōbō. Sokiri taba imō ariya. Barokitei. Jinbara ryōdaba. Nōbō. Narakinji. Keiri mabata shamei. Saraba atazu shubō. Aseiyō. Saraba botanō. Maba bagya. maba dozu. Tanyata. On abarokei rokyatei. Kyaratei. Ikeiri makabōjisatoba. Saraba saraba. Mara mara. Mama. Keiridayō. Kuro kuro kyarabō. Doro doro. Bajayatei. Makabajayatei. Dara dara. Chirini jinbaraya. Shara shara. Mama. Batsumara. Bokuteirei. Ikei ikei. Shidda shidda. Arasan harashari. Basha basan. Harashaya. Koro koro. Mara. Koro keiri. Sara sara. Shiri shiri. Soro soro. Bōjiya bōjiya. Bōdaya bōdaya. Miteiriya. Narakinji. Darishuninō. Hayamanō. Sowaka. Shitsudaya. Sowaka. Makashitsudaya. Sowaka. Shitsudayukei. Jinbaraya. Sowaka. Narakinji. Sowaka. Maranara shitsura. Sowaka. Bokyaya. Sowaka. Hamaka shitsudaya. Sowaka. Shakyarā shitsudaya. Sowaka. Handomakya shitsudaya. Sowaka. Narakinji. Bagyaraya. Sowaka. Mabari shōgyaraya. Sowaka. Nōbō. Aratannō. Tarayāya. Nōbō Ariyabarokitei. Jinbaraya. Sowaka. Adoration to Avalokiteśvara the Bodhisattva-Mahāsattva who is the great compassionate one! Having adored him, may I enter into the heart of the blue-necked one known as the noble adorable Avalokiteśvara! It means the completing of all meaning, it is pure, it is that which makes all beings victorious and cleanses the path of existence. To the beneficient one referred to in this Dhāraṇī beginning with "Namaḥ," hail! Homage to the Three Treasures. Homage to noble Avalokitesvara, noble Bodhisattva Mahasattva, who embodies great compassion. Om. Homage to you, who protects all those who are fearful. Being one with you, the Blue-necked noble Avalokitesvara, I bring forth your radiant heart that grants all wishes, overcomes obstacles, and purifies delusion. Here is the mantra: Om. You are luminous with shining wisdom. You transcend the world. O, Lion King, great Bodhisattva. Remember, remember, this heart. Act, act. Realize, realize. Continue, continue. Victor, great victor. Maintain, maintain. Embodiment of freedom. Arise, arise, the immaculate one, the undefiled being. Advance, advance. You are supreme on this earth. You remove the harm of greed. You remove the harm of hatred. You remove the harm of delusion. Lion King, remove, remove all defilements. The universal lotus grows from your navel. Act, act. Cease, cease. Flow, flow. Awake, awake. Compassionate one, enlighten, enlighten. Blue-necked One, you bring joy to those who wish to see clearly. Svaha. You succeed. Svaha. You greatly succeed. Svaha. You have mastered the practice. Svaha. Blue-necked one. Svaha. Boar-faced one, lion-faced one. Svaha. You hold the lotus. Svaha. You hold the blade wheel. Svaha. You liberate through the sound of the conch. Svaha. You hold a great staff. Svaha. You are the dark conqueror abiding near the left shoulder. Svaha. You wear a tiger skin. Svaha. Homage to the Three Treasures. Homage to noble Avalokiteshvara. Svaha. Realize all the phrases of this mantra. Svaha. Nārāyaṇa (那羅延天 Naraen-ten), the Buddhist version of Vishnu riding on Garuda, as depicted in the Besson-zakki. Note the two animal heads (lion and boar?) on the left and right. Chandra (1988) criticized both Suzuki's translation and his characterization of dhāraṇīs as "[conveying] no intelligent signification ... mostly consist[ing] of invocations and exclamations" and provided an alternative translation - a corrected version of an earlier translation by the same author (1979) - based on his reconstruction of the text (see 'Reconstructed Sanskrit text' above). 1. Adoration to the Triple Gem. Adoration to ārya Avalokiteśvarā, bodhisattva, mahāsattva, the Great Compassionate One. Oṃ. Having paid adoration to One who protects in all dangers, here is the [recitation] of the names of Nīlakaṇṭha, as chanted by ārya Avalokiteśvarā. 2. I shall enunciate the 'heart' [dhāraṇī] which ensures all aims, is pure and invincible for all beings, and which purifies the path of existence. 3. THUS. Oṃ. O Effulgence, World-Transcendent, come, oh Hari, the great bodhisattva, descend, descend. Bear in mind my heart-dhāraṇī. Accomplish, accomplish the work. Hold fast, hold fast, Victor, oh Great Victor. Hold on, hold on, oh Lord of the Earth. Move, move, oh my Immaculate Image. Come, come, Thou with the black serpent as Thy sacred thread. Destroy every poison. Quick, quick, oh Strong Being. Quick, Quick, oh Hari. Descend, descend, come down, come down, condescend, condescend. Being enlightened enlighten me, oh merciful Nīlakaṇṭha. Gladden my heart by appearing unto me. To the Siddha hail. To the Great Siddha hail. To the Lord of Siddha Yogins hail. To Nīlakaṇṭha hail. To the Boar-faced One hail. To the One with the face of Narasiṃha hail. To One who has a lotus in His hand hail. To the Holder of a cakra in His hand hail. To One who sports a lotus(?) in His hand hail. To Nīlakaṇṭha the tiger hail. To the mighty Śaṇkara hail. 4. Adoration to the Triple Gem. Adoration to ārya Avalokiteśvarā, hail. The Korean form of the dhāraṇī stands midway between the short and the long versions; despite being generally more akin to the shorter version used in other East Asian countries, it exhibits certain readings found in the longer version (see 'Longer version' below). Namo radana darayaya. Namak aryak. Barogije saebaraya. Mojisadabaya. Maha sadabaya. Mahagaronigaya. Om. Salba bayesu. Darana garaya dasamyeong. Namak kkaridaba imam arya. Barogijesaebara daba. Niraganta namak harinaya. Mabalda isami. Salbalta sadanam suban. Ayeyeom. Salba bodanam. Babamara misudagam. Danyata. Om arogye aroga majiroga. Jigaranje. Hye hye harye. Maha moji sadaba. Samara samara. Harinaya. Guroguro galma. Sadaya sadaya. Doro doro miyeonje. Maha miyeonje. Dara dara. Darin. Narye saebara. Jara jara. Mara mimara amara. Moljeye. Hye hye. Rogye saebara ra-a. Misami nasaya. Nabe sami sami nasaya. Moha jara misami nasaya. Horo horo. Mara horo harye. Banama naba. Sara sara. Siri siri. Soro soro. Motjya motjya. Modaya modaya. Maedariya. Niraganta. Gamasa nalsanam. Baraharanaya manak. Sabaha. Sitdaya. Sabaha. Mahasitdaya. Sabaha. Sitda yuye saebaraya. Sabaha. Niragantaya. Sabaha. Baraha mokka. Singha mokkaya. Sabaha. Banama hattaya. Sabaha. Jagara yokdaya. Sabaha. Sangka seopnane. Modanaya. Sabaha. Mahara guta daraya. Sabaha. Bamasa ganta isasi cheda. Garinna inaya. Sabaha. Magara jalma. Ibasanaya. Sabaha. Namo radana darayaya. Namak aryak barogije. Saebaraya sabaha. The following is a reconstruction of the underlying Sanskrit text of the Korean version as given in Chandra (1988). 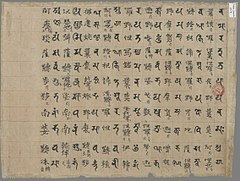 Part of an 8th-century manuscript of the longer version of the Nīlakaṇṭha Dhāraṇī from Dunhuang (British Library, Or.8212/175), written in both late Brahmi/Siddhaṃ and Sogdian scripts. The following is a transliteration of the longer version of the dhāraṇī and an accompanying Sanskrit version (originally written in Siddhaṃ; given in Romanized form below) made by Vajrabodhi (T. 1061). A Vietnamese (Champa) depiction of Shiva dating from the 9th-10th century. Note the serpent hanging from Shiva's left shoulder serving as his upavita (sacred thread). The dhāraṇī describes Nīlakaṇṭha as kṛṣṇa-sarpopavīta or kṛṣṇa-sarpa-kṛta-yajñopavīta, "one who has made the black serpent into a yajñopavīta." As noted above, the longer version as preserved by Vajrabodhi provides evidence that the dhāraṇī, in its original form, was a recitation of Nīlakaṇṭha's names by Avalokiteśvara (Āryāvalokiteśvara-bhāṣitaṃ Nīlakaṇṭha-nāma "the names of Nīlakaṇṭha uttered (bhāṣita) by ārya Avalokiteśvara"), suggesting that the two figures were not yet conflated with each other at this stage. This version also contains more epithets associated with Shiva and Vishnu than the standard shorter version, such as Maheśvara, Mahākāla, Tripura-dahaneśvara, Mahācala ("the great immovable (acala) one"), Lakuṭadhara ("the bearer of a club"; cf. Lakulisha), halāhala-viṣa nirjita ("subduer of the halāhala poison"), vyāghra-carma-nivasana ("he who wears a tiger skin"), Nārāyaṇa-balopabala-veśa-dhara ("having the prowess and vestments (veśa) of Nārāyaṇa"), Padmanābha ("the lotus-naveled"), or śaṇkha-śabda-nibodhana ("he who awakens (with the) sound of a conch"). ^ Killing, stealing, sexual misconduct, lying, flattery or irresponsible speech, defamation, duplicity, greed, anger, and foolishness or the holding of mistaken views. ^ Text based on Hiroyasu (1908) and, compared with Siddhaṃ and Katakana version in Kobayashi (1926). ^ a b c d Jayarava. "Nīlakaṇṭha Dhāraṇī". Visible Mantra : Buddhist Calligraphy. ^ a b c d e Chandra (1988): p. 92. ^ Giles (1957): pp. 105-106. ^ a b c d Chandra (1988): p. 95. ^ Chandra (1988): p. 186. ^ Chandra (1988): p. 238. ^ Chandra (1988): pp. 238-264. ^ Chandra (1988): pp. 44, 48. ^ Lopez Jr., Donald S.; Buswell Jr., Robert E., eds. (2013). The Princeton Dictionary of Buddhism. Princeton University Press. p. 189. ISBN 978-1400848058. ^ a b Chandra (1988): p. 233. ^ Chandra (1988): p. 13. ^ Chandra (1988): pp. 233-234, 238. ^ a b "Or.8212/175 Recto". International Dunhuang Project. ^ a b Gauthiot, Robert Edmond; De La Vallée-Poussin, Louis Étienne Joseph Marie (1912). "Fragment Final de la Nilakanthadharani': En Brahmi et en Transcription Sogdienne". Journal of the Royal Asiatic Society of Great Britain and Ireland. Cambridge University Press: 629–645. JSTOR 25190068. ^ a b c d Chandra (1988): pp. 228-231. ^ Agnew, Neville; Reed, Marcia; Ball, Tevvy, eds. (2016). Cave Temples of Dunhuang: Buddhist Art on China's Silk Road. Getty Publications. p. 196. ISBN 978-1606064894. ^ a b c "Dhāraṇī". Encyclopedia Iranica. ^ Chandra (1988): p. 31. ^ a b c Chandra (1988): pp. 32, 187. ^ a b Beal, Samuel. "An Attempt to Translate from the Chinese a Work known as the Confessional Service of the Great Compassionate Kwan Yin, possessing 1000 Hands and 1000 Eyes." Journal of the Royal Asiatic Society of Great Britain & Ireland, 1866, pp. 403-426. ^ Chandra (1988): p. 16. ^ Chandra (1988): pp. 29ff. ^ Keyworth, George A. (2011). "Avalokiteśvara". In Orzech, Charles; Sørensen, Henrik; Payne, Richard (eds.). Esoteric Buddhism and the Tantras in East Asia. Brill. pp. 525–526. ISBN 978-9004184916. ^ Chandra (1988): pp. 11, 13-14, 17, 187, 274. ^ Banerjee, Priyatosh (1992). New Light on Central Asian Art and Iconography. Abha Prakashan. p. 165. ISBN 978-8185704210. ^ a b Studholme, Alexander (2012). The Origins of Om Manipadme Hum: A Study of the Karandavyuha Sutra. SUNY Press. pp. 42–43. ISBN 978-0791488485. ^ Chandra (1988): p. 234. ^ Chandra (1988): pp. 187-188. ^ Shōwa Shinsan Kokuyaku Daizōkyō Henshūbu, ed. (1930). 昭和新纂国訳大蔵経 (Shōwa Shinsan Kokuyaku Daizōkyō). Tōhō Shoin. p. 90. ^ a b Chandra (1988): p. 48. ^ a b c d Studholme (2012): p. 41. ^ Yü, Chün-fang (2000). Kuan-yin: The Chinese Transformation of Avalokitesvara. Columbia University Press. pp. 65–66. ISBN 978-0231502757. ^ Biswas, Sampa (2010). Indian Influence on the Art of Japan. Northern Book Centre. p. 75. ISBN 978-8172112691. ^ Studholme (2012): p. 14. ^ Beer, Robert (2003). The Handbook of Tibetan Buddhist Symbols. Serindia Publications, Inc. p. 63. ISBN 978-1932476033. ^ Griffith, Ralph T.H. "Rigveda, Book 10, Hymn 90: Puruṣa". Internet Sacred Text Archive. ^ a b Chandra (1988): pp. 48-49. ^ Studholme (2012): pp. 43-44. ^ a b Chandra (1988): p. 49. ^ Davidson, Ronald M. (2004). Indian Esoteric Buddhism: Social History of the Tantric Movement (revised ed.). Motilal Banarsidass Publishers. pp. 150–151. ISBN 978-8120819917. ^ a b c d Chandra (1988): p. 15. ^ Lokesh Chandra (1984). "The Origin of Avalokitesvara" (PDF). Indologica Taurinenaia. International Association of Sanskrit Studies. XIII (1985-1986): 189–190. Archived from the original (PDF) on June 6, 2014. Retrieved 26 July 2014. ^ Chandra (1988): p. 11, 16, 31, 40-41. ^ Chandra (1988): pp. 49-50. ^ Chandra (1988): p. 32. ^ Yü (2000). pp. 3-4. ^ Bhattacharyya, Benoytosh (1958). The Indian Buddhist Iconography. pp. 140–141. ISBN 978-5879610857. ^ "Kimnara". The Soka Gakkai Dictionary of Buddhism. Soka Gakkai. ^ "Mahoraga". The Soka Gakkai Dictionary of Buddhism. Soka Gakkai. ^ Kubo, Tsugunari; Yuyama, Akira (2007). The Lotus Sutra (Taishō Volume 9, Number 262). Translated from the Chinese of Kumārajiva (PDF). Numata Center for Buddhist Translation and Research. pp. 297–298. ^ Studholme (2012): p. 44. ^ Roberts, Tulku Yeshi (2013): p. 32. ^ Yü (2000): p. 271. ^ a b c Yü (2000): p. 69. ^ Yü (2000): pp. 271-275. ^ a b Yü (2000): p. 272. ^ Yü (2000): p. 273. ^ "T. 2843: 大悲啟請". CBETA 漢文大藏經. ^ Yü (2000): pp. 65-69. ^ Yü (2000): p. 69, 271. ^ Yü (2000): pp. 59-62. ^ a b c d "Great Compassion Dharani Sutra" (PDF). The Huntington Archive of Buddhist and Asian Art. ^ Yü (2000): p. 59. ^ a b c Yü (2000): p. 60. ^ "Ten Evil Acts". The Soka Gakkai Dictionary of Buddhism. Soka Gakkai. ^ a b Yü (2000): pp. 61-62. ^ Yü (2000): p. 61. ^ a b Yü (2000): p. 62. ^ Chandra (1988): p. 164. ^ Kwan Um School of Zen (1996). Chanting with English Translations and Temple Rules (PDF) (revised ed.). The Kwan Um School of Zen. p. 44. ^ a b Buswell, Robert E. (1992). The Zen Monastic Experience: Buddhist Practice in Contemporary Korea (revised ed.). 978-0691034775. pp. 37, 79, 81, 115. ISBN 978-0691034775. ^ Chandra (1988): p. 93. ^ "Dharani of Great Compassion". Rinzai-Obaku Zen: Official Site of the Joint Council for Japanese Rinzai and Obaku Zen. ^ Dōgen; Leighton, Taigen Daniel (trans. ); Okumura, Shohaku (1996). Dōgen's Pure Standards for the Zen Community: A Translation of Eihei Shingi. SUNY Press. p. 202. ISBN 978-0791427101. ^ Walter, Mariko Namba; Stone, Jacqueline Ilyse, eds. (2008). Death and the Afterlife in Japanese Buddhism. University of Hawaii Press. p. 279. ISBN 978-0824832049. ^ a b Hiroyasu, Kyōjū (広安恭寿) (1908). 三陀羅尼經和解 (San Darani-kyō Wage). Fujii Bunseidō (藤井文政堂). pp. 1, 50. ^ Ōmori, Gijō (大森義成) (2010). 実修真言宗の密教と修行 (Jisshū Shingon-shū no mikkyō to shūgyō). Gakken Publishing. pp. 111–114. ISBN 978-4054045248. ^ Chandra (1988): pp. 92-93. ^ "T. 1060: 千手千眼觀世音菩薩廣大圓滿無礙大悲心陀羅尼經". CBETA 漢文大藏經. ^ "T. 1113B: 大慈大悲救苦觀世音自在王菩薩廣大圓滿無礙自在青頸大悲心陀羅尼". The SAT Daizōkyō Text Database. The SAT Daizōkyō Text Database Committee. ^ "T. 1113B: 大慈大悲救苦觀世音自在王菩薩廣大圓滿無礙自在青頸大悲心陀羅尼". CBETA 漢文大藏經. ^ Chandra (1988): p. 12. ^ a b "T. 1111: 青頸觀自在菩薩心陀羅尼經". CBETA 漢文大藏經. ^ Chandra (1988): pp. 97-98. ^ Chandra (1988): pp. 92, 95. ^ a b Chandra (1988): pp. 92-98. ^ "大悲心陀罗尼 (大悲咒)" (PDF). International Buddhist Society. ^ 洪緣音 (2007). 實用佛經修持方法, Volume 2. 全佛. pp. 497–498. ^ Kinh Dược Sư. Rộng Mở Tâm Hồn. pp. 9–11. ^ 曹洞宗勤行 (Sōtō-shū Gongyō) (PDF). Amagon (www.amagon.jp). pp. 14–16. ^ "大悲心陀羅尼 (Daihishin-darani)". Yokohama Zenkōji (横浜善光寺). ^ "Daihi Shin Darani". International Zen Association United Kingdom. ^ a b "大悲心陀羅尼". Archived from the original on 2016-07-31. Retrieved 2017-07-17. ^ a b Hiroyasu (1908): pp. 65-67. ^ a b Kobayashi, Shōsei (小林正盛), ed. (1926). 真言宗聖典 (Shingon-shū Seiten). Morie Shoten (森江書店). pp. 205–207. ^ Suzuki, Daisetz Teitaro (2014). Manual of Zen Buddhism. Lulu Press. pp. 21–22. ISBN 978-1105525131. ^ a b Chandra (1988): pp. 130-133. ^ Takubo, Shūyō (田久保周誉) (1960). 真言陀羅尼蔵の解説 (Shingon darani-zō no kaisetsu). Buzan kyōiku zaidan. p. 160. ^ Kimura, Toshihiko (木村俊彦); Takenaka, Tomoyasu (竹中智泰) (1998). 禅宗の陀羅尼. Daito Shuppansha. p. 138. ISBN 978-4500006397. ^ Tanahashi, Kazuaki (2015). The Heart Sutra: A Comprehensive Guide to the Classic of Mahayana Buddhism. Shambhala Publications. pp. 311–312. ISBN 978-0834829688. ^ Chandra (1988): pp. 10-11. ^ Chandra, Lokesh (1979). "Origin of the Avalokiteśvara of Potala" (PDF). Kailash: A Journal of Himalayan Studies. Ratna Pustak Bhandar. 7 (1): 6–25. ^ "千 手 經 (천수경)". myowonsa.com. ^ Chandra (1988): pp. 139-183. ^ "Chanting - 정근". Dae Yen Sa International Buddhist Temple and Meditation Center. ^ a b Chandra (1988): p. 142. ^ Chandra (1988): pp. 120-129. ^ "T. 1061: 千手千眼觀自在菩薩廣大圓滿無礙大悲心陀羅尼呪本". CBETA 漢文大藏經. ^ Chandra (1988): p. 189. ^ "Dhāraṇī en écr. sanskrite siddham avec transcription phonétique en car. chinois". Gallica. Bibliothèque nationale de France. ^ "T. 1061: 千手千眼觀自在菩薩廣大圓滿無礙大悲心陀羅尼呪本 第1卷". CBETA 漢文大藏經. ^ Chandra (1988): pp. 189. Beal, Samuel (1866). "An Attempt to Translate from the Chinese a Work known as the Confessional Service of the Great Compassionate Kwan Yin, possessing 1000 Hands and 1000 Eyes". Journal of the Royal Asiatic Society of Great Britain and Ireland: 403–426. Chandra, Lokesh (1988). The Thousand-armed Avalokiteśvara. New Delhi: Abhinav Publications, Indira Gandhi National Centre for the Arts. ISBN 81-7017-247-0. Chandra, Lokesh (1984). "The Origin of Avalokiteśvara" (PDF). Indologica Taurinenaia. International Association of Sanskrit Studies. XIII (1985-1986): 189–190. Archived from the original (PDF) on June 6, 2014. Retrieved 26 July 2014. Chandra, Lokesh (1979). "Origin of the Avalokiteśvara of Potala" (PDF). Kailash: A Journal of Himalayan Studies. Ratna Pustak Bhandar. 7 (1): 6–25. Gauthiot, Robert Edmond; De La Vallée-Poussin, Louis Étienne Joseph Marie (1912). "Fragment Final de la Nilakanthadharani': En Brahmi et en Transcription Sogdienne". Journal of the Royal Asiatic Society of Great Britain and Ireland. Cambridge University Press: 629–645. JSTOR 25190068. Giles, Lionel (1957). Descriptive Catalogue of Chinese Manuscripts from Tun-huang in the British Museum, London. London: Trustees of the British Museum. Kubo, Tsugunari; Yuyama, Akira (2007). The Lotus Sutra (Taishō Volume 9, Number 262). Translated from the Chinese of Kumārajiva (PDF). Numata Center for Buddhist Translation and Research. Studholme, Alexander (2012). The Origins of Om Manipadme Hum: A Study of the Karandavyuha Sutra. SUNY Press. ISBN 978-0791488485. Suzuki, Daisetz Teitaro (2014). Manual of Zen Buddhism. Lulu Press. ISBN 978-1105525131. Yü, Chün-fang (2000). Kuan-yin: The Chinese Transformation of Avalokitesvara. Columbia University Press. ISBN 978-0231502757.